"Sexually transmitted diseases?" we asked. "This is New York," replied Mr Frieden. "We invented perverts." 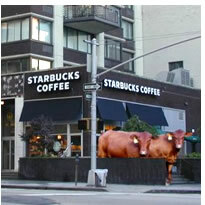 One cynical New York coffee-lover we did not interview but who insisted on shouting at our reporter across a crowded 5th Avenue, bawled: "Starbucks can milk this cash cow for all they want, it won't make their coffee taste any better than the cowshit they serve up now!"